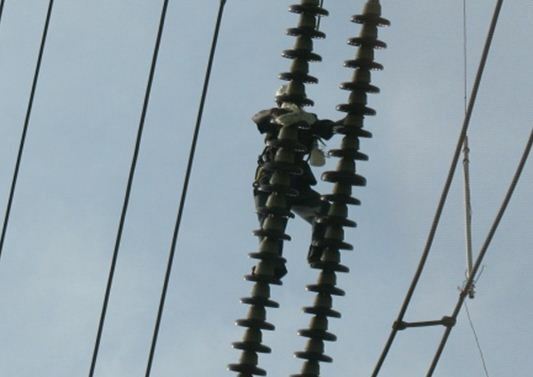 The insulators of lines & equipments are contaminated due to dust, birds droppings, chemical pollution, Saline weather etc. The contaminated insulators are susceptible for flashover during humid atmosphere, dew or foggy weather etc. hence need to be cleaned. 1) Making proper earthing arrangement. 2) Cleaning individual Insulators of each string with water. 3) Wiping off water with cotton cloth. 4) Applying GA-2000 solution with the help of low pressure spray, scrubbing firmly bonded contaminants to the insulator surface with the help of nylon brush so as to avoid “blotting paper effect” to avoid flash over problems. 5) Sobbing with normal cloth to make insulators dry from outside & inside. 6) Finally using of Tag-o-rag cloth insulators are made glossy & water repellent. 7) While doing cold line washing other works like inspection of individual insulator, tightening of hardware & arcing horns etc. can be carried out and reported to concerned officer.